Real Madrid superstar Isco handed Los Blancos the lead in extraordinary fashion scoring a superb free-kick on the stroke of half time in Madrid’s opening Champions League tie against Roma. 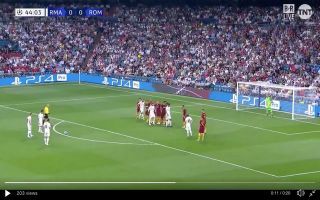 Isco curled the ball exquisitely into the top left corner of the goal leaving the Roma goalkeeper rooted to his spot. Nothing could be done to stop such a magnificent strike from hitting the back of the net. Isco could well be the man to fill Cristiano Ronaldo’s boots after the superstar shocked fans by leaving Madrid for Juventus this summer.